Spring! Pappy’s!, Brussels Sprouts!, Sauce Boss on PBS! 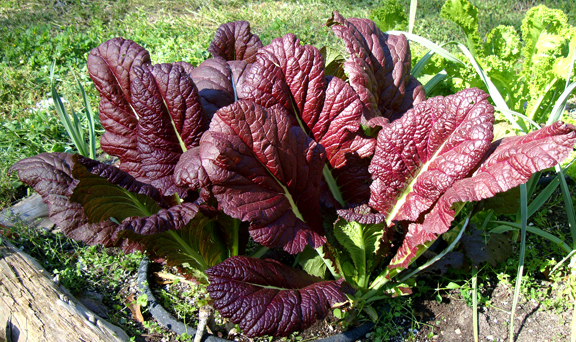 Here’s my purple mustard greens. They taste like wasabi. Boy are they Goood. Upcoming shows: Lake Worth, Tallahassee, Green Cove Springs, St Louis, Pensacola, Montgomery AL! Sauce Boss is appearing on PBS’s “My Generation” on week of March 21. Last August a film crew shot eight hours of interviews and performance in St. Louis. The show will air on over 150 stations throughout the US. Check out the times and stations near you. 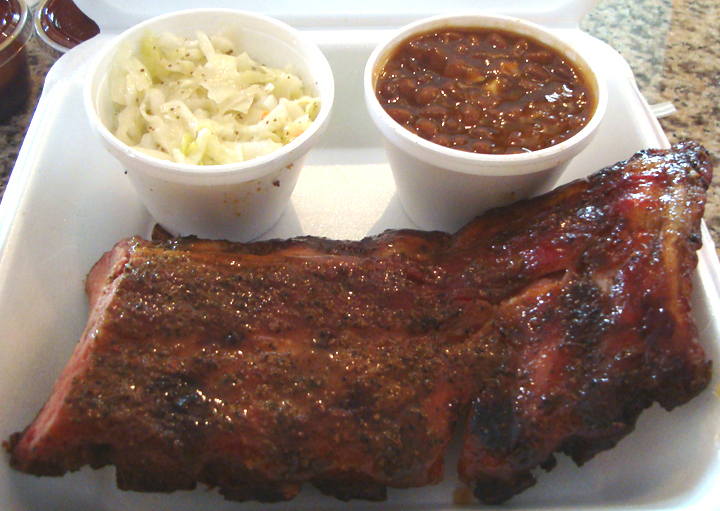 Speakin of St Louie…While I was there, all those I asked about ribs… every last one said, “Pappy’s”. So I just had to go and try em for myself. This is the place that closes when the ribs run out. And they always run out. Upon our arrival we were greeted by a huge line of hungry devotees, salivating, chompin the bit, holding their place in line with the tenacity of resolute solidarity with the carnage they were about to devour. Hoo boy, let’s do take out. And so we did. Styrofoam boxes, heavy with slaw, beans, and yes, the best St. Louis ribs in St. Louis, spirited away to BB’s club where we could eat in peace, like a bulldog in a dark closet with a large hunk of flesh. Don’t get too close. Get the picture? Fallin off the bone, succulent, perfectly cooked, spiced, and as good as any. Meats also include: pulled pork, beef brisket, pulled chicken, turkey breast, and hot links. Sides: potato salad, baked beans, slaw, sweet potato fries, baked potato, applesauce, and green beans. Sounds like a BBQ place to me. That’s the last ribs I had. I’m a veg-head these days. I like my vegetables. If every one in America ate one vegan meal a week, it would make a big difference in the greenhouse gas situation. Greenhouse gases have been determined to be a major cause of climate change (by REAL scientists). The Johns Hopkins School of Public Health suggests we go meatless on Mondays. Just one day a week without meat can reduce your consumption of saturated fat by 15% and reduce your chances of heart disease. Scientists estimate that if every American lowered meat consumption by just 20%, it would lower greenhouse gasses as much as if everyone in the country switched to driving Toyota Priuses (and think how much cheaper and easier eating less meat is!). 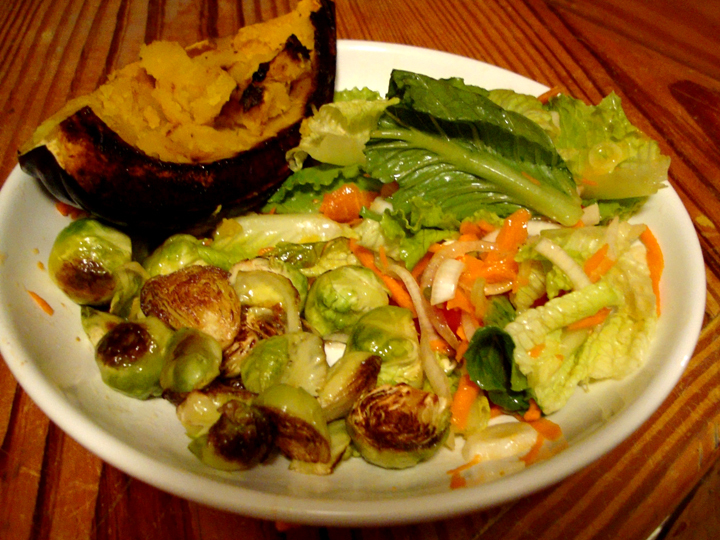 Here’s a great vegetable dinner with acorn squash, salad, and brussels sprouts. Simple, easy, and very tasty. Bake the squash. And sauté the sprouts in olive oil. Well, I took y’all around the block on this one. You are currently browsing the Sauce Boss Blog blog archives for March, 2011.